Today I have a review on the Real Techniques Instapop Eye Duo Brushes, a set of eye brushes that were recently launched. I first heard about these brushes when EmilyNoel83 used them as part of a Get Ready with Me video featuring other brushes from the line and thought it was so cool to see her do her eye look with virtually just this brush duo. I'm always into finding eye brushes that work well for my eye shape (small hooded double eyelids) so these looked super interesting. The brush set is $9.99 and available at Real Techniques and ULTA. 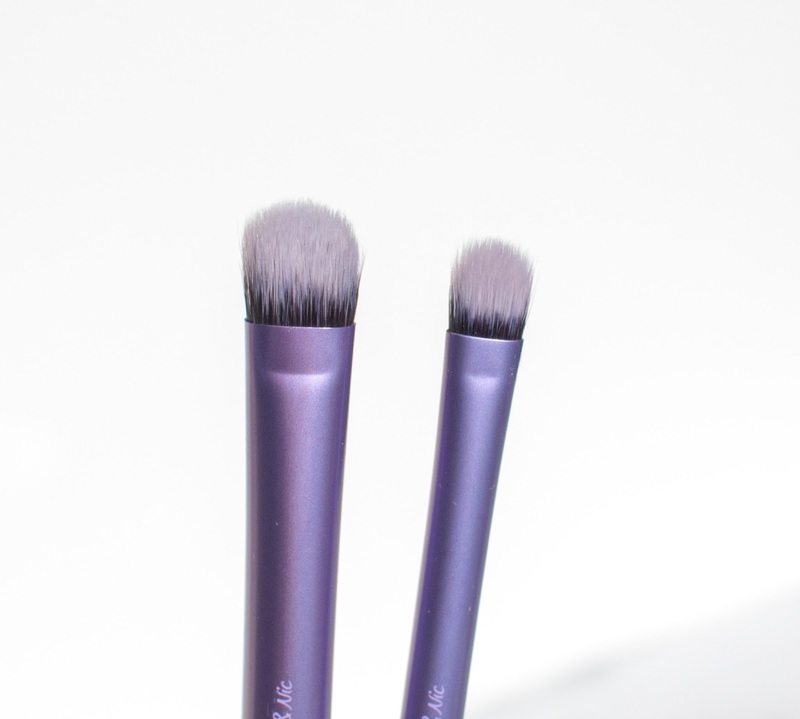 The brushes come in a set of two, you won't be able to purchase them individually. Click through to see more pictures and read my review! "The Real Techniques Instapop Eye Duo is designed for full coverage shadow application. Use to sweep on loose pigment shadows. Instapop Shade Brush: extreme taper for full lid coverage. Instapop Crease Brush: extreme taper for targeted pigment or glitter application. 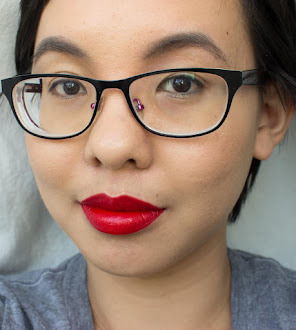 High impact color without the mess." 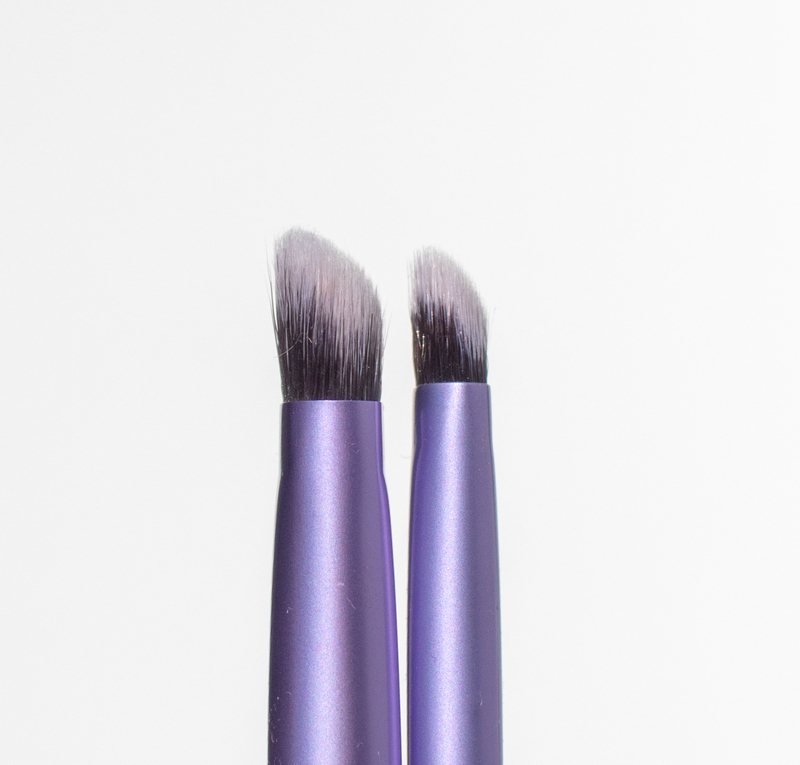 Both brush heads have a gentle angle to them and are incredibly soft, not harsh or scratchy on the eyes at all. The larger of the two is the Instapop Shade Brush; it says it's for full lid coverage but on my eyes I actually prefer it for applying a brow bone highlight or blending out color in the crease. The smaller of the two is the Instapop Crease Brush; it says it's for targeting pigment or glitter application but I prefer it for applying and blending out color into the crease. Like all Real Techniques brushes, these are made out of synthetic bristles. Typically synthetic bristles are meant for liquid or cream products and not as much for powder. I know they have their Powderbleu line of brushes which are meant to be used with powder products but the only eye brush in that range is more like a fluffy crease brush and is not meant to pack on products like this range. I think the angle/cut of the brush does a great job of picking up and packing on powder products. I know it's marketed towards loose pigments/eyeshadows, but it does just as well of a job with pressed eyeshadows too. This doesn't entirely eliminate fallout (most of which can be eliminated by tapping off your brushes) but does help reduce it. 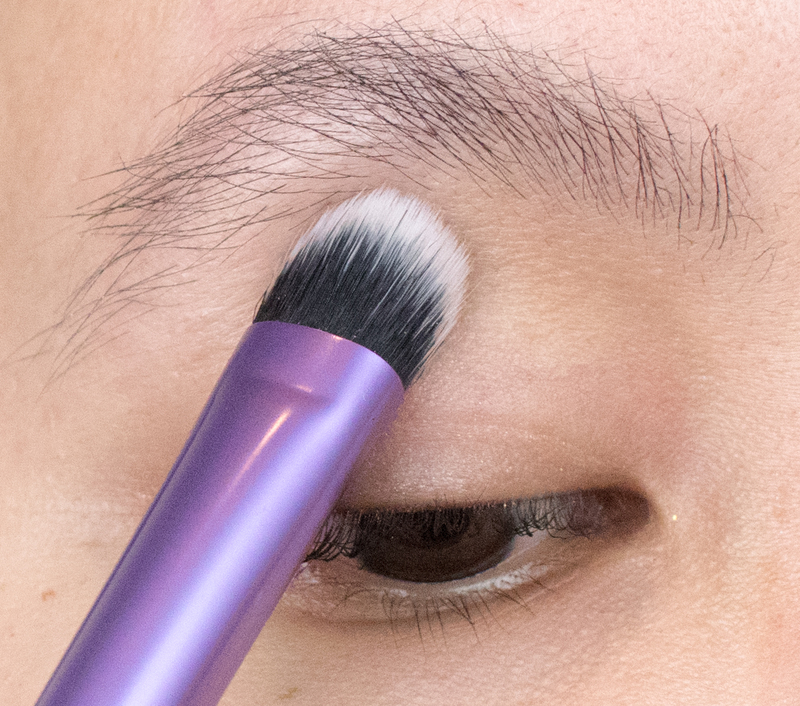 Here's how the brushes look against my eyes if you wanted an idea of the size. The first picture is of the Crease Brush while the second picture is of the Shade Brush. 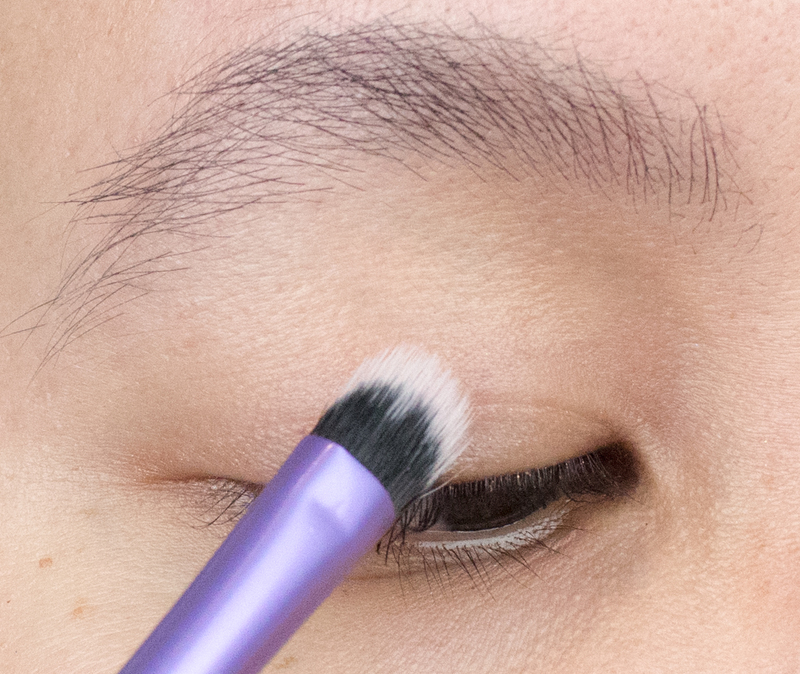 I think the reason why I like this brush set is because I can do virtually my whole eye look, using the angled side to pack on color (like on the lid) while using the tip to help blend it out and prevent harsh lines. I love that the shape allows me to apply eyeshadow without needing to move or change the position of my hand/wrists constantly throughout. If you're someone who may have difficulty with a lot of hand/wrist movements or carpal tunnel while applying your eyeshadow, you could consider trying these brushes because the angled head does give you a bit more versatility than the typical flat eyeshadow brushes. I highly recommend these brushes, I love using them with my pressed and loose eyeshadows. The shape allows for very versatile effects and works well for packing on and blending out eyeshadows. These slot in very easily in my eye brush collection and $9.99 is a great price for the two. What are some of your favorite eye brushes? Disclaimer: I purchased these eye brushes myself. All opinions are my own. I was not compensated for this post. The post contains affiliate links, which provide me with a commission based on your use of the link when making a purchase. I have a couple of RT eye brushes that I really like. I need to expand on the "collection" a bit. I like the angle on these. I very well might pick them up! These look great! One of my favorite eye brushes is a fluffy crease brush from Japonesque! I like the size of the crease brush! I am actually on the hunt for some new eyeshadow brushes and will check these out. That's a great price. I find their eyeshadow brushes are hit or miss since sometimes they're too soft. 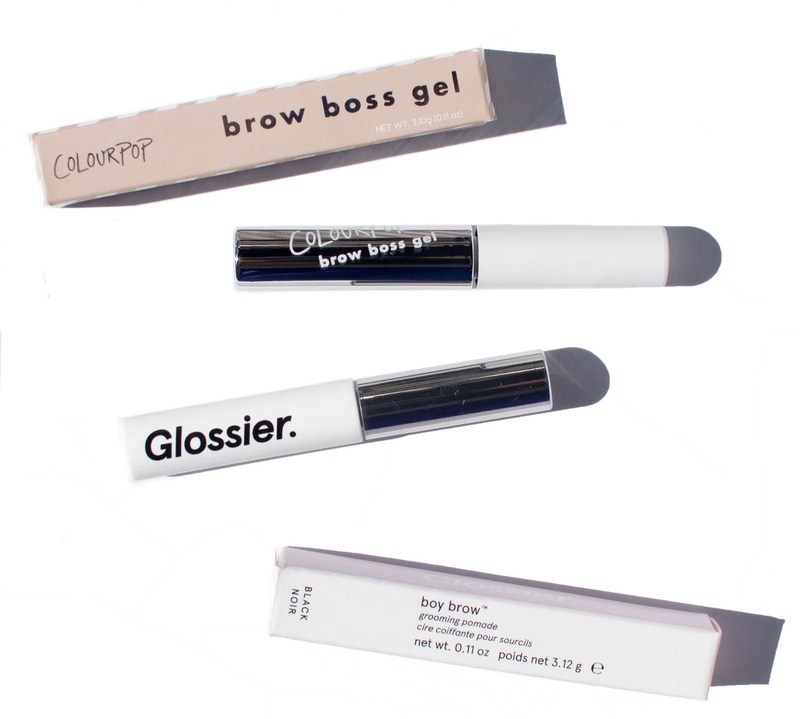 These sound GREAT for loose shadows-- which always end up all over my face!